Do you love coffee but are not sure what to do with those leftover K cups? 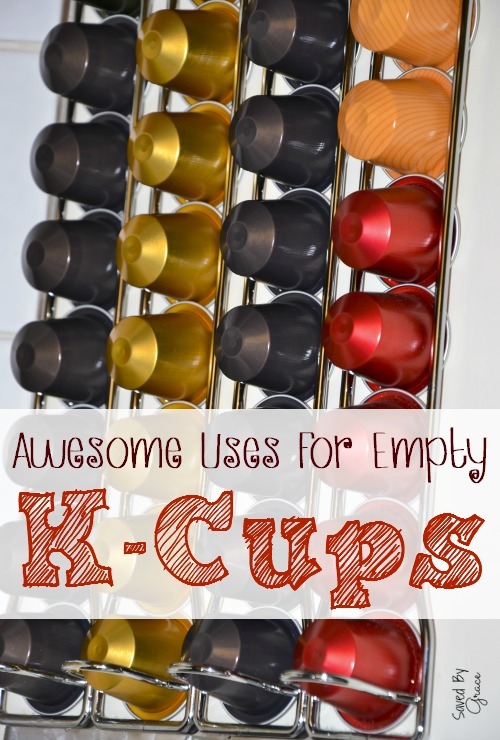 Here are several uses for empty k cups! There are some really cute crafts floating around in the name of K cups. Some of the best crafts involve emptying the cups and filling them with something that makes sounds (rice or noodles). Of course, you will want to cover the cup after you fill it with something like paper and a tight rubber band. This is one of the most genius ways to use your empty K cups. Take out the coffee grounds and place fertilized soil and a seed within in the K-cup. Keep in mind that once the seed gets big enough, you will need to transfer it to the garden. However, this is still genius in many ways because you can actually reuse the cup for something productive. There have been many times when I have needed a small container just to put smaller craft items in. After using K-cups for my coffee and not having any use for them, I thought I might as well use them for my crafts. I’ve put buttons in the cups or used them to hold pins and needles. Really, anything small enough to fit has gone inside one of these cups. K cups are the perfect size to make into Christmas ornaments. You can remove the coffee and the lid and make them into a multitude of items. – Cut out a picture the size of the K-cup top and use a crafting pin to put in the name and date. – Cover the top of the K-cup with scrap paper and decorate how you’d like. – Really, this is a K-cup project that is dependent on the creativity of the one making it. Instead of throwing those K cups into the trash the next time you’re done with them, consider reusing them in some way shape or form. What ways have you recycle or reused an empty K-cup? I have never used K Cups as a craft, but I would like to do the Christmas idea. It sounds cute and I would have to figure out how I want them to look on the tree. I think it is a good idea!